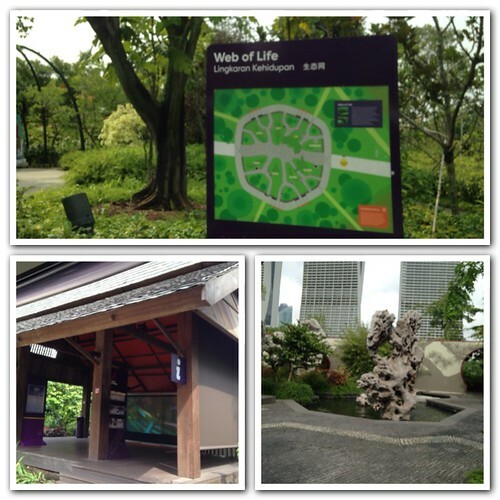 See Part 1 – Flower Dome and Cloud Forest. Every time we visit The Gardens by the Bay in Singapore, we usually only visit the Flower Dome and Cloud Forest because it’s air-conditioned. During our recent visit, we finally managed to take a walk in the Supertree Grove and the guided audio tour of the outdoor gardens. Although comprised mostly of concrete and steel, the trunks of the Supertrees are covered with living plants from over 200 species and varieties of bromeliads, orchids, ferns and tropical flowering climbers, including Tillandsia stricta from Brazil, Tillandsia fasciculate from Panama, Cattleya maxima from Ecuador, and Pseudorhipsalis from Costa Rica. The Supertrees provide environmentally sustainable functions for the Gardens. Some contain photovoltaic cells to harvest solar energy for lighting up the Supertrees while others are integrated with the air-conditioned conservatories and serve as air exhaust receptacles. Since the boys had never seen the outdoor gardens of Gardens by the Bay, we spent an evening and a morning touring the outdoor areas when the weather is cooler. One of the things they wanted to do was take a walk along the OCBC Skyway. The OCBC Skyway is a 128-meter walkway connecting two Supertrees at the Supertree Grove. The walkway is at a height of 22 meters above the ground and provides a 360 panoramic view of the park. The walkway is opened from 9am-9pm so you can enjoy the view in daylight and at night time when the Supertrees light up like a scene out of Avatar. 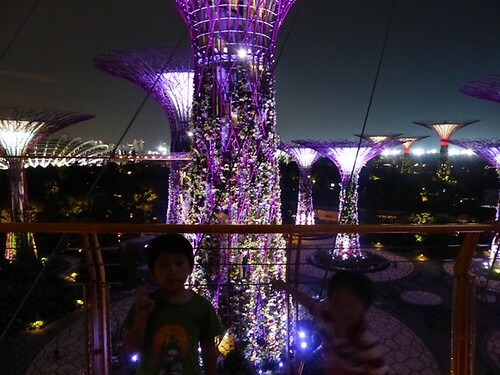 The tickets to the Supertree Skyway are S$5 for adults and S$3 for kids. It entitles you to go up once only. Once you come down, you will need to purchase another ticket if you want to go back up again. 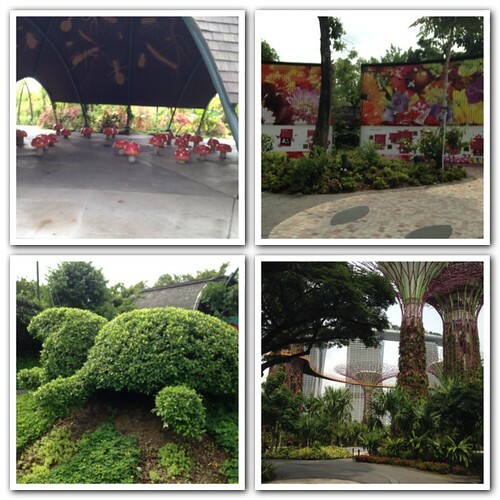 You get unlimited entry if you have a Gardens by the Bay annual pass. At the top of one of the Supertrees in the Supertree Grove there is a restaurant called IndoChine. At 50 meters up, dining at this restaurant can be an experience in itself. Unfortunately, the word from our Singaporean friends is that the food is lousy and the service is worse (let’s hope they work on these aspects and not ride on their view as their sole selling point). There is a cover charge just to be up there so maybe sticking to the skyway is enough. There is an audio recording telling you about each of these areas in brief so it is both an informative and a visually stimulating experience. Given the extent of the outdoor gardens, taking the Garden Cruiser was definitely worth it because the boys would not have made the distance on foot. Even then, there are areas the Garden Cruiser does not cover so there is still more to explore! Tickets for the Garden Cruiser are S$5 for adults and S$3 for children. It starts at the visitor centre and finishes up at the canopy (although you can take it all the way back to the start if you want). This is a temporary exhibition that is on until the end of November 2013. The purpose of this exhibition is to illustrate the importance of a clean water system for the conservation and protection of a biodiversity-rich environment. Aristotle participated by making an origami lotus which he added to the River of Life display. They also had some other activities like the Fruit Loop Scavenger Hunt, Carried Away Garden Trail, and the River of Life Gaia Trail. There is actually quite a lot to eat at The Gardens. We had dinner at Casa Verde at Supertree Dining which was surprisingly good, and brunch at Majestic Bay Seafood Restaurant which served some pretty decent Yum Cha. We also enjoyed a serve of ice cream from Seventh Heaven – which I had to bribe Hercules with because he wouldn’t leave the Gardens. I have to give Hercules 100% for enthusiasm. It is unfortunate that it also means leaving any venue is always hard. Wow, sound interesting..we planned to go on this coming Friday..hopefully my boys (5 & 3 ) will enjoy as well..